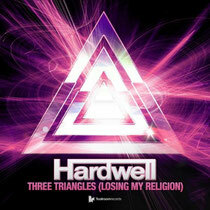 Hardwell returns today with 'Three Triangles (Losing My Religion)’, released on Toolroom Records. ‘Three Triangles’ is already a club anthem in its own right and now gets an extra dimension with REM’s classic ‘Losing My Religion’ lyrics added. Through his energetic sound, Hardwell has created a recipe for big room house. On the road, he has countless festival appearances coming up this summer including Tomorrowland, EDC London, Dance Valley and Global Gathering. He launches his ‘Hardwell Presents Revealed Volume 4’ compilation at his Las Vegas residency Hakkasan. Revealed Recording artist’s Dyro and Dannic, will also be joining him as part of their Revealed North American tour. Taking place on June 20, a special appearance on the night will feature Heather Bright aka Bright Lights who will perform ‘Never Say Goodbye’ live on stage with Hardwell and Dyro.